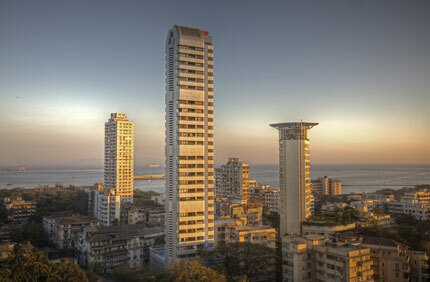 The Mumbai skyline as seen from the Taj President Hotel. Like other megacities, the large cities of India are grappling with the conflicting logic of globalization and localization. As new networks of global trade and finance create new opportunities, developer-friendly architecture and planning are appropriating contemporary discourses, and producing urban forms hitherto unknown. Globalization and its influence are thus transforming the city as physical, social, and cultural boundaries are being renegotiated. On the one hand, India’s booming economy has fueled a euphoric decade of development, embraced by a new generation of architects bent on transforming the traditional dynamics of practice. At the same time, the nation is plagued by a one-size-fits-all architecture created by globetrotting architects and multinational players who are more focused on singular objects and signature buildings. A land of dazzling opportunities and paradoxes; a paradise of manufactured faux cities for the nouveaux riches and a hell for slumdogs: such is the predicament of India. These thoughts came to mind at the recent conference Emerging Exchanges: New Architectures of India, held at Parsons the New School for Design in New York, and organized jointly by the New School, the India China Institute, and the Architectural League. Unfortunately, the two-day event’s agenda of “exchanges” hardly seemed to touch the complex challenges of contemporary practice in India and was a lost opportunity to engender real dialogue. Not only did this event highlight the major disconnect between academia and architecture, it signaled a cultural blind spot that spells nothing short of hopelessness for millions of sprawl- and slum-dwellers written off by western architects and planners. With the possible exception of China, no nation other than India stands at such a crossroads in terms of development, diversity, and social divisions. The huge buzz about the country’s economic growth is manifest in the malls, retail complexes, multiplexes, and luxury residential towers sprouting up across the nation, their glass-and-metal facades emblematic of the New India. Far from taking place under the government radar, this growth has been sanctioned by India’s planning authorities. As long as a plan is produced for bureaucratic formality, officials are more than happy to approve haphazard, large-scale schemes that have no long-term strategies or detailed analyses of their impact. Virtually no consideration is given to the environmental consequences, local economies, or the social and cultural fabric of communities. Displacement through dispersal—of agricultural land, people, businesses, and slum dwellers—is consequently rampant. Global consumerism has also driven the huge desire of up-and-coming cities to ape the likes of London and Dubai, hence the parade of international-style projects symptomatic of our time, dropped into completely different cultural and social contexts in emerging economies. These desires are fanned by the bureaucrats and urban elites who opt for a “global” architectural language to shape and narrate their national ambition, without regard for local culture and politics. We’ve seen all this before, notably in China, where cities like Beijing and Shenzhen failed to capitalize on their reinvention as opportunities to define a sustainable model for urbanization. Mumbai and other fast-growing urban centers have taken misguided cues from these artificial cities, effectively conceived as large-scale architecture, producing nothing but postcard urbanism. In such places elite architects create their iconic buildings, while large international firms busily reproduce the old in new attire. Such urban-design and planning strategies, already failed elsewhere, are constantly being reemployed, never more swiftly than with today’s Photoshop urbanism, where renderings are swapped in and out with total disregard for regional concerns. The current predicament is an opportunity to slow down and rethink our strategies. The architectural profession needs to reposition itself toward engagement, rather than merely export the largely western, 20th-century models and values that have created more of the same everywhere. Economists, sociologists, cultural critics, and others have long recognized the perils of globalization. We would do well to draw upon this body of thought to consider what role, if any, architecture and urban design may play in defining a new kind of urbanism for the 21st century—one that is both socio-economically and environmentally sustainable. If we do not think about rapid urbanization now in light of the global risks of population growth, poverty, and climate crisis, we will face its irreversible aftermath in the immediate future. This is a crisis we can certainly avoid. Historically, architecture has been at the core of cultural production, and has played a pivotal role in defining cultural space and physical form. However, under globalization, the question of “culture” hangs in the balance: While the flattening of cultural geographies and “globalism” are pushing toward more homogenized world culture, the profession is busy building symbols of global capital in response, instead of investigating architecture as an urban construct—which it inevitably is. India provides an excellent case study for investigating the city of the coming century, as the largest democracy on earth negotiates urbanization and economic development on a staggering scale. Contemporary architectural practice should focus on the context of regional and national perspectives, as well as local practices. A true global exchange is where international architects and their counterparts in India can learn from each other to find better local solutions to global challenges, and advocate for high standards for the built environment in conjunction with intelligent city governance and management structures. Our top priorities should include employing appropriate technologies and construction practices to engage the large available skilled and unskilled labor force in India; and devising architecture as infrastructure that integrates and addresses the scarcity of resources, climate change, and other escalating pressures to produce environmentally sustainable architecture and more livable urban environments. The condition of production prompted by transnational exchanges—along with architecture that responds to global consumerism—is not necessarily a bad thing. Nor should it automatically produce insensitive projects. As long as there is some degree of self-assessment, along with a willingness to engage with local vernacular practices and amplify the latent qualities of particular locales, engagement and partnerships could engender more inclusive approaches toward an open-ended architecture capable of sensible change and growth. The truth is that fantastic challenges lay ahead. Cities like Mumbai, Hyderabad, Bangalore, Pune, Ahmadabad, Kolkata, Surat, and Delhi are some of the most exciting places to design on the planet, because they are at once loved and loathed, messy and modern, chaotic and lyrical, rich and poor, old and new, vigorous and corrupt. Above all, they are naively energetic in their insatiable hunger for growth. Unlike western cities, Indian cities are rural in spirit, shaped by the slow linking of towns and villages. They have retained their rural character, as well as overlapping hierarchies of public and private spaces where distinctions are easily blurred, and “contamination” an accepted norm generating, altering, and constantly modifying the urban landscape, creating transitory urbanism with not-so-clearly defined boundaries. Every space is a contested territory, ephemeral yet rooted, and perpetually dynamic. In many instances, contamination and messy urbanism of the “informal” are traits closely related to poverty, a lack of resources, and the need for sustenance that have translated into historic patterns stigmatizing Indian cities. Today’s global economic slowdown may be a blessing in disguise for India, allowing the nation to take stock of its growth in a more sustainable manner. In this context we must reengage design practices that result from a genuine exchange between the local and the global. The promise of such cultural dialogue has animated the fields of sociology, linguistics, and cultural history, and there’s no reason why architecture can’t also contribute to creative, engaging, and inclusive international dialogue. Divergent multiplicities rather than assumed uniformity in architecture and design should be the focus. It would be a missed opportunity if we use this situation as merely new fertile ground for the urban elite—including the self-indulgent prophets and self-fulfilling architectural prophecies that pass for high design these days. I am wearier of the global elite than of the slumdog, and look forward to the exchanges yet to come.